Old House Vineyards – A Glass Full of History, Hospitality & Fine Wine! Vine Spot recently saddled up and rode into the historic and charm-filled town of Culpepper to pay a visit to a young - yet blossoming Virginia winery. Located at the foothills of the Blue Ridge Mountains and situated upon a 75 acre former alfalfa farm, sits Old House Vineyards. Old House Vineyards is a small family run farm winery owned by Patrick and Allyson Kearney that produces a limited production of estate bottled, hand-crafted wines. Winemaking duties are assumed by former Afton Mountain's winemaker, Matthieu Finot, who also consults with First Colony Winery and newcomer Potomac Point, which I am quite eager to visit. The tasting room is housed in an attractive multi-leveled 19th century restored farm house that exudes early Victorian appeal. Surrounding the attractive home are beautifully manicured greens and a garden area with picnic tables & chairs complimented by a relaxing babbling fountain. Tranquility! From vintage Victorian on the exterior, you step into a tasting room that boasts elegance and modernity with fine detail and tasteful décor. Be sure to tour the house before or after your tasting, and do not forget to stroll past the gift shop where the “Wicked Bottom” shorts appear to be a popular summertime item. Speaking of tasting, let’s try Old House wines friends. 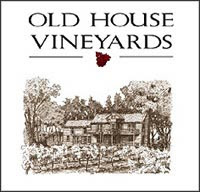 Old House Vineyards has no tasting fees, with the exception of $1 for guests who wish to sample the Artica – a rich ice-styled dessert wine made from late harvest Vidal Blanc grapes. Tip: This delicious wine is definitely worth the $1 dollar fee to taste, and should be considered as a sweet ending to a savory meal. During our tasting, the Chardonnay 2004 proved a nice selection with good fruit flavors heightened by oak aging. The off-dry Vidal Blanc 2005, which we enjoyed over lunch, offers stone fruit and soft tropical aromas that carried through to the palate with a slight sprinkling of sweetness. The popular Clover Hill selection, a dry Vidal Blanc, was sold out, but the 2006 vintage is expected in the tasting room in a few weeks. Also expected, just in time for the dog days of summer is an off –dry Cabernet Franc Rosé wine, which I have been told is an excellent warm weather sipper, and versatile enough to pair with lite picnic fare. Looking for a nice local bargain red to pair with pizza or even a Five Guys Burger? Try the An’ Samhradh, a fruit forward and easy drinking blend of Chambourcin, Cabernet Franc and a splash of Vidal that is reasonably priced at $12.99. What’s more popular than a pair of ladies “Wicked Bottom” shorts? None other than the Wicked Bottom wine friends! The Wicked Bottom 2005 is 100% Chambourcin displaying the grape’s trademark deep color with inviting aromatics and dark cherry and berry flavors that are rounded out nicely by barrel aging. Also, offered are a 2002 and 2003 Merlot, which will be the last offerings of this popular French grape variety at Old House. These selections were grown and made by former winemaker Doug Fabbioli of Fabbioli Cellars in Loudoun County; for a fuller, richer example go with the 2002; however, if your palate lends itself to softer reds, the 2003 is for you. Following a tasting of Old House wines guests can purchase lite gourmet fare to pair with their favorite wine selection(s), or opt to pack a picnic basket and enjoy breathtaking views of the vineyard, nearby pond, and Blue Ridge mountains from the welcoming country porch. There are also picnic tables located on the common lawn area, as well as several pleasant indoor rooms, from sun-filled and bright, to cozy and dimly lit, suited for enjoying a glass of wine and friendly conversation. Play a game of Chess on the front lawn - Checkmate! Old House Vineyards is also a child friendly winery, as noted by the oversized chess board and pieces that guests can literally play on the front lawn. So bring the family and enjoy the leisurely country atmosphere. In addition, some of Old House wines can be found in a number of local wine and gourmet stores, as well as several local restaurants, including the Inn at Little Washington, and your better Bed & Breakfasts. Also, check their special events page for fun-filled wine activities throughout the year. For a winery that is a mere 5 and some change years old, Old House appears mature beyond its years. When you visit the Kearney’s delightful farm winery, please be sure to let them know you read about them here on Virginia Vine Spot.